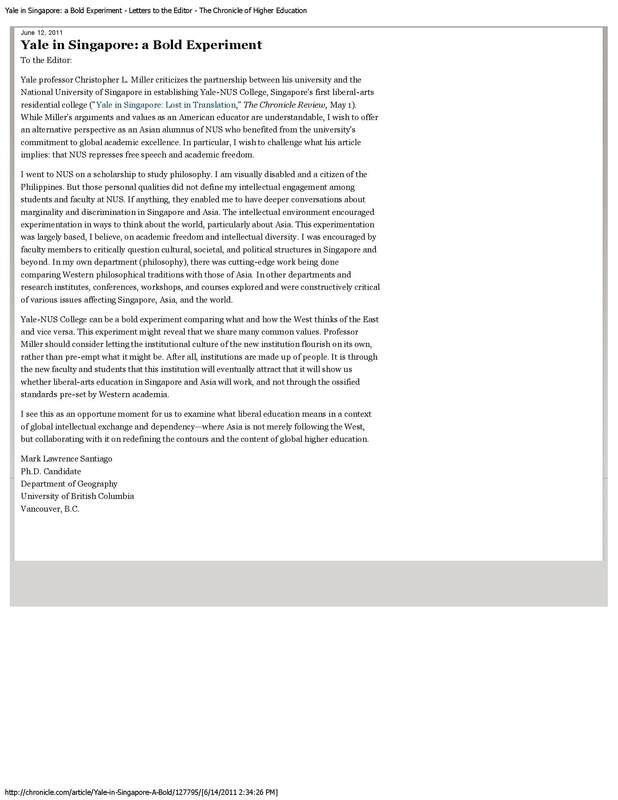 This was a letter from Mr Mark Lawrence Santiago, a Ph.D. candidate for the Department of Geography at the University of British Columbia and an NUS alumnus, in response to the article “Yale in Singapore: Lost in Translation” published on The Chronicle Review (1 May 2011) which implied that NUS represses free speech and academic freedom. In his letter, Mr Santiago challenged the implications and shared his personal experiences at NUS. 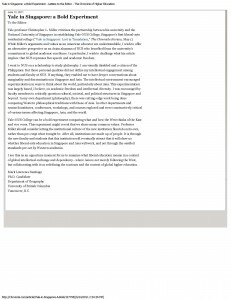 Mr Santiago, who pursued a degree in philosophy at NUS, said that the intellectual environment at NUS encouraged experimentation in ways to think about the world and particularly about Asia. This experimentation was largely based on academic freedom and intellectual diversity. Mr Santiago opined that the Yale-NUS College could be a bold experiment comparing what and how the West thinks of the East and vice versa.